Trading as the Verna Toy Company, Eva Barnett began producing dolls and soft toys in 1941, in Melbourne. Known as a quality and creative doll maker, it was not until 1948, when ownership changed to Arthur Eaton, that teddies began to be produced. Verna dolls were often made of fabric or felt, with cloth mask (buckram) faces, and were stuffed with kapok. This filling felt soft in smaller dolls but created a much heavier large doll! It was also difficult to wash successfully as it tended to clump and settle in awkward ways! Teddy bears became Verna’s main product. These earliest bears were fully jointed, usually made from medium pile golden mohair, and stuffed with kapok, or a kapok/woodwool blend. Therefore, they were quite heavy for their size. Eyes were glass, with black pupils, and painted orange on the backs. Often they had tilt growlers, with the paw pads made from heavy cotton or vinyl. Distinctively, Verna teddies had a blunt muzzle, which gave them a flat muzzle profile, and had a black kidney-shaped piece of felt on the nose. This often rubbed off over time, leaving teddy nose-less. Each came tagged with an embroidered tag saying ‘VERNA/MADE IN AUSTRALIA’ in pale orange letters, on a white background. With advancements in production, and changes in the expectations of consumers, toys became cheaper and more plentiful. Together with new safety regulations, plastic eyes were now required to be used in children’s toys and a greater range of synthetic fur was developed. Verna teddies from this period were no longer jointed, having arms outstetched, and with a moulded foam rubber filling. Pads were often made of vinyl during the 1960s, with later 1970s ones having pads of the same fabric. The distictive blunt muzzle was still retained, with the plastic eyes having black pupils and orange surrounds. The nose was a black, round and embroidered, or cloth, later ones being made of black plastic. 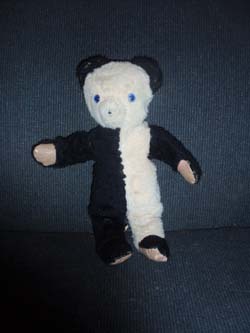 A variety of teddies and pandas was produced, in various colours. With a reduction in import tariffs, in the late 1970s-early 1980s, the subsequent influx of cheap Asian toys severely affected the Australian toy market. 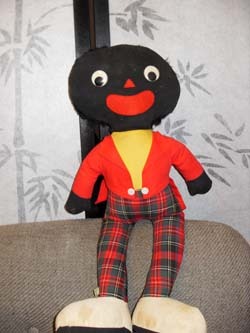 Verna attempted to remain in the market by producing a range of cheaper teddies. These were very similar to those made in China at that time, and could have been made in China rather than Australia. Each was jointed with plastic joints, made of synthetic fabric and withÂ plastic eyes. They are often confused with the Chinese teddies, and are only distinguishable by the printed tag. The company could not remain viable, and ceased production in the early 1990s. Verna teddies and dolls are very collectable, with the earliest teddies fetching $200-$500 in the Australian market, depending on size, appeal and condition. 1960s unjointed teddies sell for between $30-$70. My daughter was given a Verna Teddy Bear in 1977 by a friend of mine who had it since she was little in the 1960s. It has the Verna label on the inside of his leg, but has a long snout which is different to most descriptions. The growler worked up until a few years ago. Can someone please tell more about this bear? He is a very interesting Verna! His long, inset muzzle is unusual. The short pile synthetic plush used on his snout and pads was used on some of their other 1960s toys, such as pyjama cases and monkeys. He also has the same plastic nose and eyes as other 1960s toys, and would definitely date from this time. He looks to be made of synthetic plush and with foam stuffing. Distinctively, his body shape, claws and ears are rare, and so his expected value would be from $50-$60 on ebay, and $60-$80 if he was sold at a collectors fair. Your cute ‘teddy’ is a Verna panda, made in the 1970s. Similar pandas were also made in the 60s, but the pads were made of vinyl. His filling is moulded in one piece from foam rubber and he has plastic safety (lock-in) eyes. His value on ebay SHOULD be $20-$25, though to buy him at a teddy bear fair or antique shop could be up to $40. I have a doll that I have had for 54 years and I think she may have been second hand when I received her. I have always called her Verna and she is actually marked on the back ‘Verna Made in Australia’. I think she had several trips to the Doll Hospital for makeovers and I probably received her for several Christmases looking quite different each time ( different wigs I think). I am interested in finding out a little of her history and I assume she was made by the Verna Company. I would also like to give her a makeover and have her look like the original. If she was manufactured by this company would there be pictures showiing how she looked? Yes-your lovely doll was made by the Verna company, which began as a doll-making firm, before branching out into teddies and other soft toys. She would have been made in the 1950s from ‘hard plastic’, around 1953-4. She looks to have the ‘flrty’ eyes, and would have originally have had one of a modest range of wig types and outfits. Some were brunette, others blonde. She most likely had a short cut similar to the one she currently has, though some came with long plaits! In the next couple of days I’ll put up a couple of pictures to help you know better what she would have looked like. She appears to be in great condition, and these dolls are quite collectable. Doll Fairs (held in major cities) are also a good place to see dolls similar to her! I wonder if you can help me. I was born in the year 1975 and on the day of my birth my Father bought for me two Pandas, it was a mother and baby set. 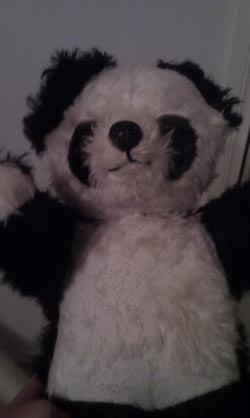 My small Panda is very similar to the picture on the comment page by “Elaine”. Although my Pandas had a red bow each and a little red tongue sticking out. I have no idea the make. I hope you can help me. 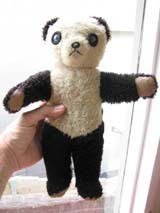 Your pandas may well have been made by Verna, though Joy Toys, Jakas and Wendy Boston made ones in a similar style, as did several companies in Japan and China, though these bears had rounder ears. Stuffing was foam rubber, either in one piece or crumbed, and the fabric was synthetic plush. If they had vinyl pads they would have been made in the 1960s, and if they were fabric, your pandas were made closer to your birthday. 1960s Vernas had a kidney-shaped felt nose which is often missing now. If you have a picture of them that you could post that would be great, as it would show the type of eyes, nose shape and mouth shape, all of which help to positively identify the maker. Verna teddies are very collectable! Your panda would have been made in the 1970s, (with safety eyes) and from quality synthetic plush (probably with a woven backing). His stuffing would be foam rubber. He is a nice big size, and Verna were known for their quality toys. His value at a collectors’ fair would be $40-$60, and on ebay $30-$40. Hi Kylie. I know it’s a few years since you posted the photo of your panda bear. I have been looking for that exact bear, same make, size, same eyes. I had one, my favourite toy, as a child. If you still have it, would you consider selling it? If yes, please post and i’ll give you my email address. Fingers crossed! It’s great that you still have your teddy! Yes, he would have been made in the 1960s, from synthetic plush, and with foam filling. His pads are vinyl, and his nose would have been a kidney-shaped piece of black felt that was glued on. This can easily be replaced, if you want to. Verna referred to his design as a ‘panda’. 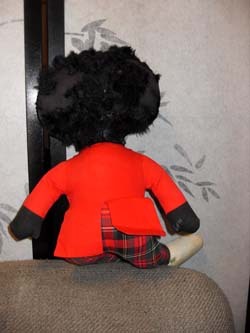 He is quite collectable-Verna teds are sought-after. He would sell at a Collectors’ Fair for $40-$70. We bought this at the Goodwill thought he is adorable and needed a home. His tag says Joy Toys made in Australia cloth body eyes plastic. You did well finding him in an Op Shop! Joy Toys made gollies for many years, especially during the 1960s and 70s. Your golly would have been made in the late 1960s-mid 1970s. He would have foam stuffing and is made from cotton and various synthetic fabrics. He appears to be in good condition and so would sell at a Collectors’ fair for $70-$100. Wondering what you can tell me about this Verna bear. He has the embroided tag. 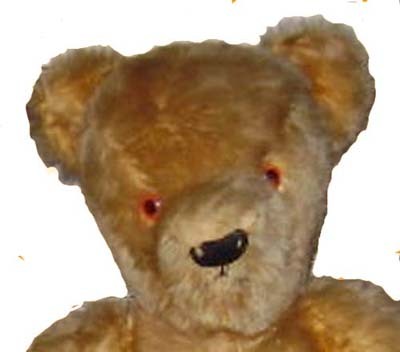 Teddy would have been made in the 1960s, from a short pile synthetic plush, and with foam stuffing. He is cute, and looks to be quite large, so would have a value to collectors of $40-$60. Yes-he definitely is a very cute teddy!! He is also in great condition and unusual, with unjointed arms but jointed legs! Are the arms cut out of the same piece of fabric as the body, or are they sewn on later? By his quality and the look of his fur, his fabric may be a mohair blend. He was bought in Tasmania and I was about 5 or 6 yrs old when he was given to me (late 1963 or 1964)so was old enough to take good care of him. Later he was covered up and stored away so that helped to keep him in good condition. Any idea of his value? He is in wonderful condition! His cute face would appeal to collectors and together with his bigger size and age, mean his value at a Collectors’ Fair would be $150-$225. Verna teddies have lovely sweet faces, and are very collectable. He is a larger size, which makes him a bit rarer than the more common 30cm teddies. The repair job would lower his value, though, depending whether it could be re-done more sympathetically. Hi!! 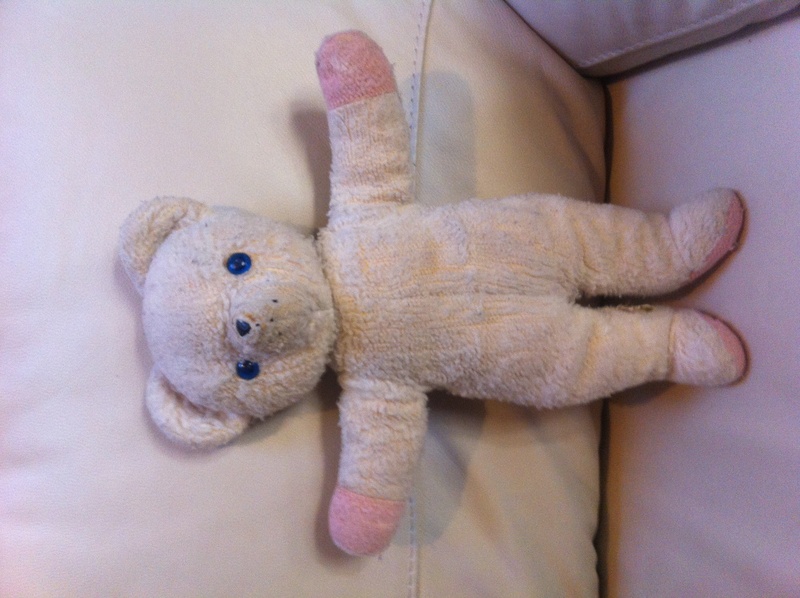 I have a verna teddy who has been very well loved over the past 27 years by me and a long time before that by my sister! i would love to pass him onto my 18 month old but i dont think he would survive long. As much as i would love her to have him, i can’t bear (no pun intended!) to see him fall apart! So…….i am in search of a new-old Ted! Does anybody know where i could find one very similar to him? preferably in better condition though, i must have been a rough kid, poor Ted! Due to a technical glitch, the reply I left has disappeared, so I am reposting it! It’s great that you still have your much-loved teddy! Verna teddies are occasionally offered for sale on ebay, and so you could try regular searches on that site. We also see them occasionally at the Collectors’ Fairs, and are happy to look out for you. Would it be possible to load a picture of teddy as that would help to find one who is very similar. 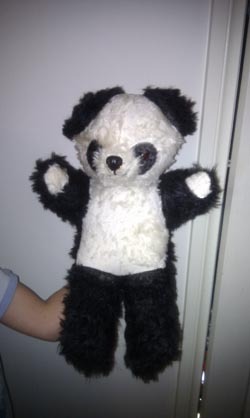 Hi, I also have a much loved Verna Teddy & am also looking for one similar to buy my niece. Could you look out for one. He would be from the 1960’s with the vinyl pads. About 30cm. Thank you so much. I would really appreciate any help to find one. 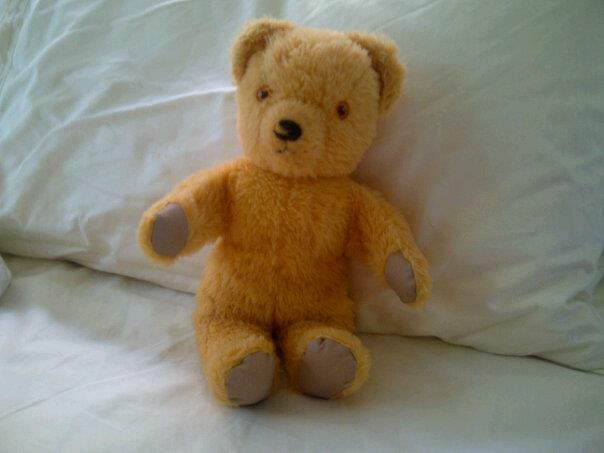 Hi, I’m wondering if you could give me some details on my old teddy that I have had since birth in the mid 70’s? He has “Verna” made in Australia on the tag located on the inside of his right leg an he used to have a hard plastic nose. It’s great that you still have your teddy! He is still in good condition, though as you know, is missing his nose! 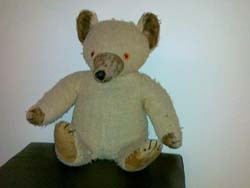 One option to replace it, if you wished to, is to purchase a very badly worn teddy from the same era, and use his nose! Without it, though, it gives him character, and makes him ‘your’ teddy! He was made in the early 70s, from synthetic plush, with lock-in safety eyes, and with foam stuffing. Verna teds are very collectable, and he would sell at a fair for around $30. Hi, Just wondering what you could tell me about this Verna Mama Bridal Doll, it was given to my mother in 1956 for her 8th Birthday. A neighbour made wooden and glass cases for it and for her sister’s doll the same, they have been kept in these cases. 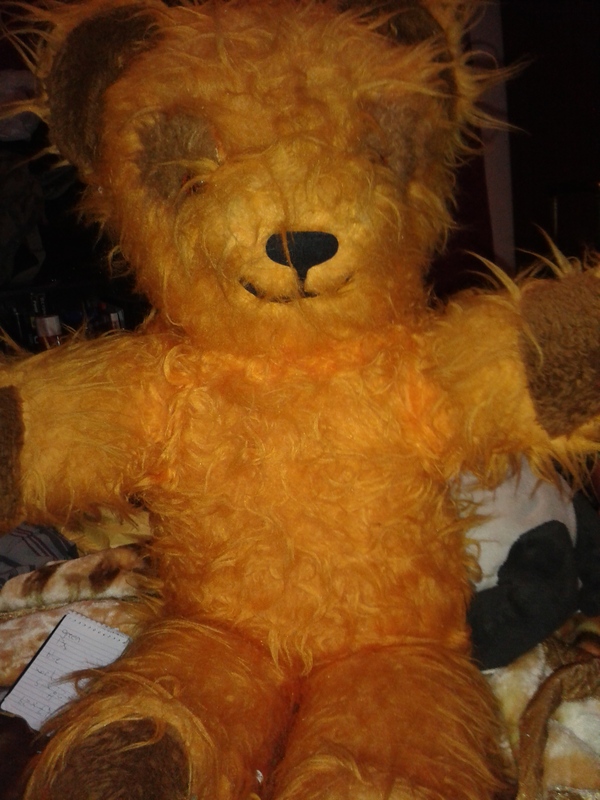 I have a Verna very big orange teddy bear that was given to me in the 1970’s.probably about 1974 -76. He was bigger than me at the time. Apart from his growl not working any more, he has no tears or damage.